Christmas has always been my favorite holiday. As a child, I have fond memories of going with my parents and younger brother to the Christmas tree farm. We would brave the cold and snow in search of the “perfect” Christmas tree. Once we got the tree back to our house, we would turn on Christmas music and decorate the tree as a family. 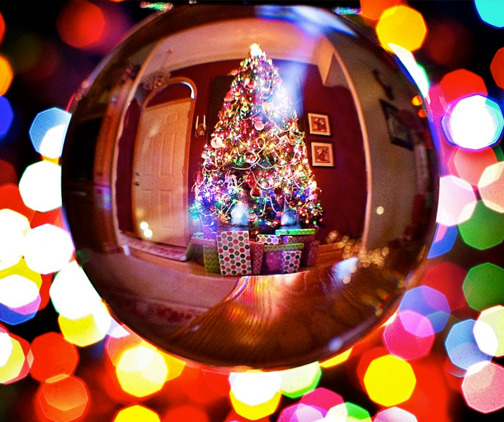 I always looked forward to the Christmas season, and I loved putting up the Christmas tree. Now, putting up the Christmas tree is bittersweet. While I still love the Christmas season, the holidays are very different. I no longer live at home with my parents, and my closest family members are hundreds of miles away. I’ve always envisioned myself being married with kids, but that hasn’t happened yet. So, instead of cutting down a real tree and decorating it with family, I find myself putting up an artificial pre-lit tree and decorating it by myself. It would be easier to skip putting up a Christmas tree, but each year I choose to continue to do it because my Christmas tree is full of memories. Some ornaments were given to me by friends or students, but most of the ornaments are the same ones that hung on our family Christmas tree when I was a child. They remind me of Christmases full of excitement, happiness, and fun. This part is also bittersweet, because now Christmas (and all holidays) are a mixture of joy and grief. The first time I remember grief slipping into the holidays is when my mom was initially diagnosed with breast cancer. With each holiday, I remember thinking, “Will this be our last one together?” Presents became less important to me, as I started to focus more on being present with the people around me. All I wanted was more time with them. Nine years after her diagnosis, my family and I experienced our first Christmas without my mom. Grief didn’t just slip in that Christmas, it seemed heavy, like a thick blanket of snow. But, just as the Christmas lights glimmered in the night, moments of joy pierced through the darkness. Sometimes you just need a little bit of light to give you hope. Today, I don’t feel weighed down by grief, but it still lingers. And I’ve learned that’s ok. In order to grieve, you first have to experience love, and I’m thankful to have had a mom who showed me love. As I look upon my decorated Christmas tree, memories fill my mind. The memories may be bittersweet, but at least I still have the memories. My eyes always gravitate towards the top of my tree, though. There, underneath the angel, are ornaments that remind me of my mom. Even though it’s hard not having her here, I know she’s with the angels, celebrating the birth of our Savior in heaven, while I celebrate His birth here on earth. Some day we will once again celebrate together. Thinking about that always brings me joy. To read Julie’s personal blog, check out: www.pagesofloveblog.com . Wow, what beautiful words of love and hope. I too have learned: In order to grieve, you first have to experience love, and I’m so lucky to have had a mom who showed me so much love. Michelle, I’m so thankful you also had a mom who showed you love. I hope during this holiday season you take the time to share with others some of those good memories that you have of your mom….even if those memories cause you to miss her more. Allowing others into our grief also allows them to get to know the ones we’re grieving for. Your Christmas story is so beautiful and so meaningful to me Julie! I also love to decorate my Christmas tree and put my old beautiful village on my mantle! I also miss my dear Mother and Father very much at Christmas time! I have my special memories but I also feel sad too! I remember your dear Mother as a wonderful close friend and I was happy to be a bridesmaid in her beautiful wedding along with Mary! I wish you a blessed Merry Christmas and a Happy New Year! Joanne, I have fond memories of coming to your house and seeing your beautiful mantel during the Christmas season. I’m glad you’re continuing that tradition. My mom was fortunate to have so many wonderful friends. I pray that the memories of your parents will bring you comfort this holiday season.